The latest generation of training apps makes it far easier to record and analyse your training, as well as setting goals and targets and reviewing previous performances. We’ve chosen 10 of the most popular apps so you can kick start 2013 with a digital thump. And with smartphones now offering GPS maps and large colour screens, many cyclists are opting to use them in place of a dedicated cycle computer. Either mounted to the handlebars or safely stored in a jacket pocket, recording your ride on a smartphone is now common. Garmin’s Fit app allows you to use your iPhone or Android smartphone as a training tool. It can be used for various sports, and one you’ve finished it uploads your session to Garmin Connect. It costs 69p but Connect itself is free to use. Once there you get all the important data and there’s useful functions like a calendar that totals your hours of riding each week, giving you an easy way of tracking your training progress. This app functions as bike computer but can also store your route in Google maps, which can then be exported to social media networks like Twitter nad Facebook. A calendar makes it easy to see your recent rides at a glance and help to plan your next ride, and your favourite routes can be saved for future use. You can easily keep track of training rides with graphs of the total distance and time accumulated with this app. Information is clearly presented with the main screen a log showing some of your latest rides, so you can see at a glance how training has been going. You can also search your recorded rides too. Data is manually entered, but there’s an Autofill option for rapid entry. Only available for iPhone and costs $19.99. This app lets you share and compare in a number of sports. As well as speed, distance, time, it works with compatible heart rate monitor straps and cadence modules. You can replay tracks on Google Maps, share with Facebook and Twitter friends, and export to the SportsTrack website. It only works with Android phones and costs £2.99. A popular choice for cyclists, as it stems from Joe Friel’s TrainingBible series of books, Training Peaks is a very comprehensive training package that offers unlimited detail and control of your workout data. There’s training plans that can be bought and downloaded, taking the guesswork out of training, and there’s the novel Virtual Coach too. Works for Android, iPhone, iPod and iPad. CoachMyRide, only available for the iPhone, lets you set goals and choose training sessions from a library of 105 included in the app. And for analysing sessions, Lionel Reynaurd is a professional cycling coach is available to offer feedback and share his knowledge. AS you progress in your training and you get fitter, the app easily adapts your training to suit. Endomondo is a community based workout app that lets you challenge friends and analyse your training. A clean and clear display shows distance, speed and time when cycling, and you can customise what is show on the screen. Once you’ve done a ride you can upload to the website where you can create groups for your friends to share rides, and share through Facebook. With a Bluetooth heart rate strap you can add heart rate data to your training data. It’s free and works across all platforms. Described as the “Swiss army knife of GPS tracking and timing” Kinetic lets you organise your training sessions by activity or event. It can set goals and monitor your progress against a predicted finish time. Voice notifications chart your progress in real-time. Kinetic GPS Lite is free, while the full version is $3.99. Rather than automatically logging your ride data, which is fine if you want to use your smartphone on the bike, Cychosis differs by requiring you to manually enter data from each ride. So you can leave your phone safely at home or not have the battery drained in 5 minutes by the constant GPS usage, and enter ride information form your cycle computer when you’ve finished your ride. And if you love your spreadsheets, you can export ride data to your computer. One of the most popular apps is Strava, because of its unique feature of letting you compared times on ‘segments’ of road. Users can create segments themselves, and any person that has ridden along this segment is added to a leaderboard. So you can see who is fastest on your favourite climb for example. With a community revolving around this feature, it adds a competitive element to training on your own. A suite of power and heart rate analysis tools makes it a good option for those who want to take their training seriously. Available for iPhone and Android. 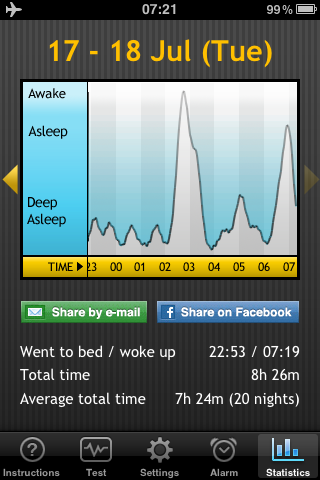 Been thinking I have not been sleeping well lately – not helped by the fact I came in from my 40km ride last night at 9pm. Always takes me a bit to switch off. Have a app called sleep cycle which monitors your sleep pattern by picking up how much movement you make during the night to determine your moment of deep sleep. I woke at 3:30 for a drink of water then up at 6:50. 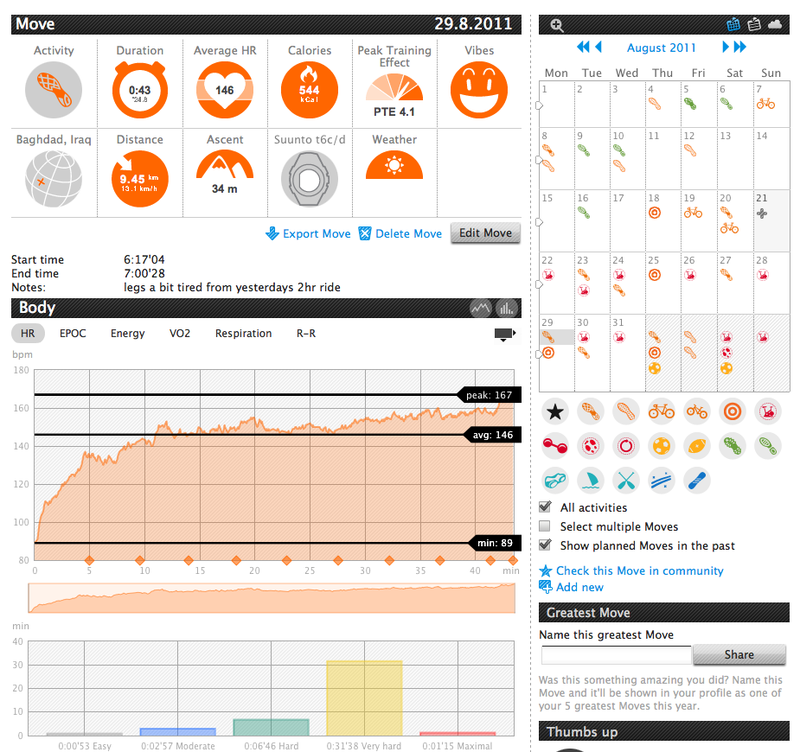 Monitoring over a few days gives you quite an insight into what you do at night and how that affects training. To some of us geeky MAMILS (middle aged men in Lycra), one of the biggest pleasures, next to the ride or run itself, is quantifying the vast amount of data available to us about our performance. 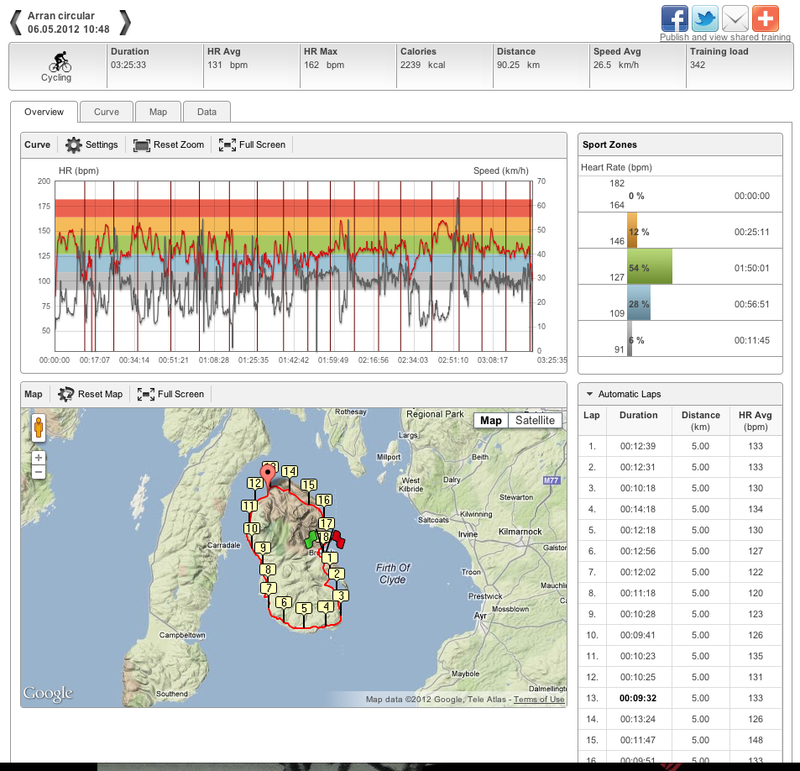 The prevalence of GPS based and downloadable cycling computers, combined with various websites and programs have made it possible to catalog, view and analyze mountains of data; metrics from average pace to peak wattage vs. peak heart rate are now at your fingertips. Here’s a quick overview of a couple of the more common sites and programs out there. Strava.com is the relative new kid on the block in terms of ride analysis. Offering both free and frankly too expensive subscription services ($6 per month or $59 per year) will allow riders to directly upload rides from their GPS devices and track their performance. Displaying a GPS track of the route you rode, along with an elevation profile and metrics such as distance, elevation gain, moving time, speed (max and average), average speed, average cadence and average power, you get a mass of information to sift through and analyse. 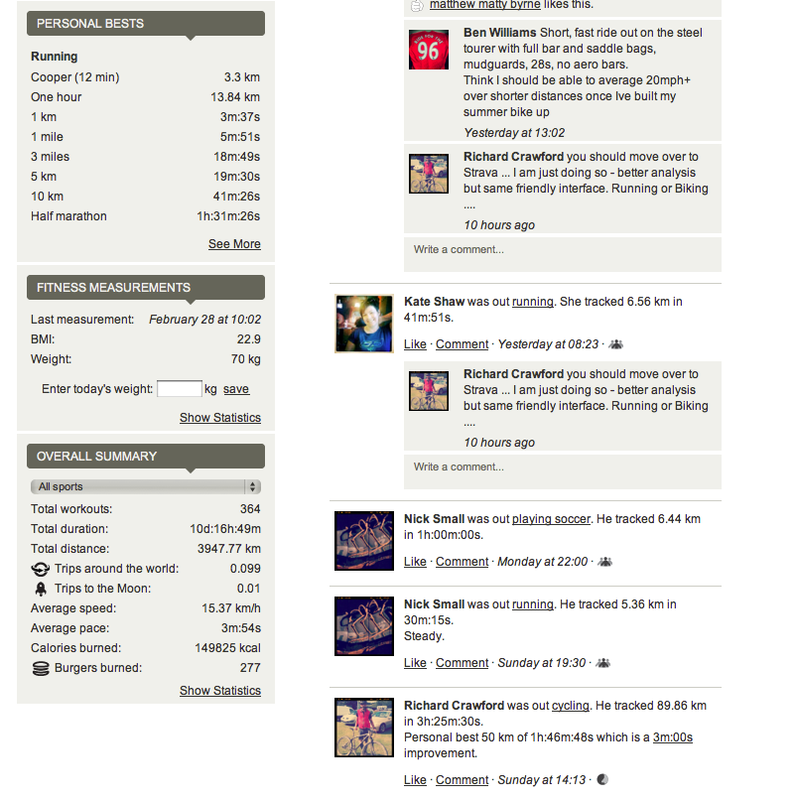 The coolest thing about Strava and it is something that Endomondo also does is social connection …. 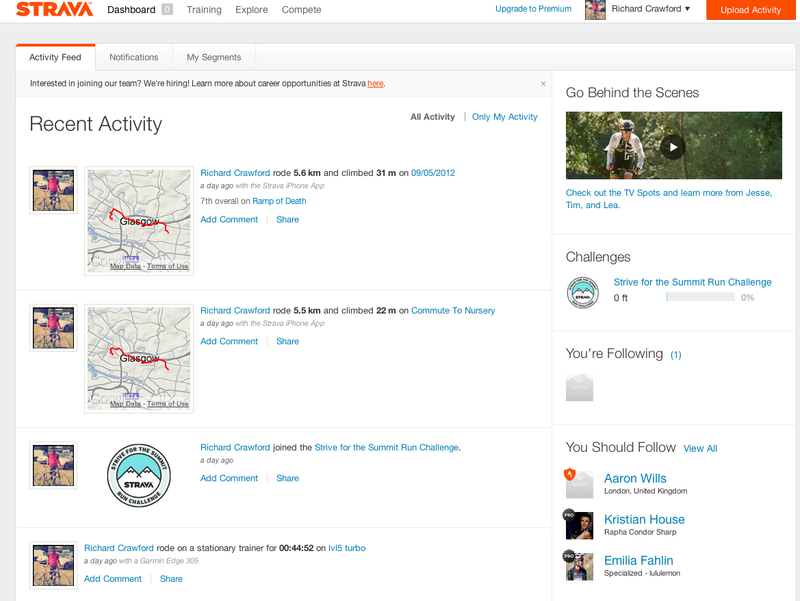 You can link Strava to your Facebook page and twitter account and you can even challenge friends (or strangers for that matter) to competitions. Strava has a unique feature that allows you to designate segments of your ride and run (climbs, TTs, crazy descents) that you can measure against every other person on Strava that has covered that route (or just a section) before and uploaded their ride. It’s an excellent idea that promotes competition and growth amongst different riders all riding in the same area. 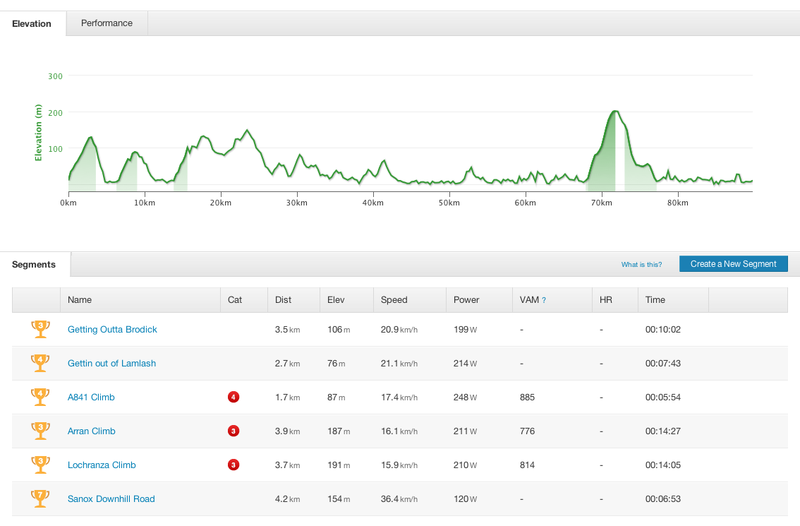 Here is a section of the Arran ride that someone has made into sections … woo hoo I did well without even knowing it. For example, imagine your club has a friendly “climbing competition” up a particularly long, steep, or otherwise nasty climb. Anyone who is a member of Strava who uploads a ride containing that climb will be ranked based upon speed, power, time and VAM (Vertical Ascent Meters) along with everyone else who has ridden that climb. The best part of the whole thing is that once the climb is designated on Strava, the site software automatically finds that segment of your ride and analyzes it, compares it to everyone else, and posts it in ranking of fastest to slowest. It’s an excellent tool to use to compare both your form compared to others around you, and to chart your own progress by comparing to your previous attempts. My old favourite social exercise site – allowed you to see your friends workouts and comment on them. Again it allows analysis of the ride or run and also keep a note of your PB’s. The social interaction may be slightly better on Endo although I prefer the slightly better analysis on Strava …. Again there is a dedicated app for iPhone so you can use that on commutes when your gps or hem is at home. Both these sites are better with Garmin products and that is more to do with the disinterest on the part of Polar and suunto more than the development of either of these two platforms. At the moment I import the gpx track from file although this loses the hrm info from the exercise. At the moment you can import the average and max readings into the endo workout but it is not a true graph. Good analysis but lacking social connections as there is no app and your friends can’t compare to you. Better analysis but even less social connections. this watch looks very cool – not sure if it will record but might be a great interface for an endomondo or running app on my iPhone …. Pebble can change instantly, thanks to its brilliant, outdoor-readable electronic-paper (e-paper) display. We’ve designed tons of watchfaces already, with more coming every day. Choose your favourite watchfaces using Pebble’s iPhone or Android app. Then as the day progresses, effortlessly switch to the one that matches your mood, activity or outfit. Android users can also receive Text Messages (SMS) on their Pebble. Unfortunately iPhone does not expose this data. Have any suggestions for other notification types? Leave us a message in the comments! Anyone non-Scottish out there that understands? These look perfect – must get me some. Great article from Wired showing that it is the vision and photographer that make great images and not just the best gear junkie …..
Bernhard Eisel of team HTC gives an interview at Stage 15 in Montpellier, France. 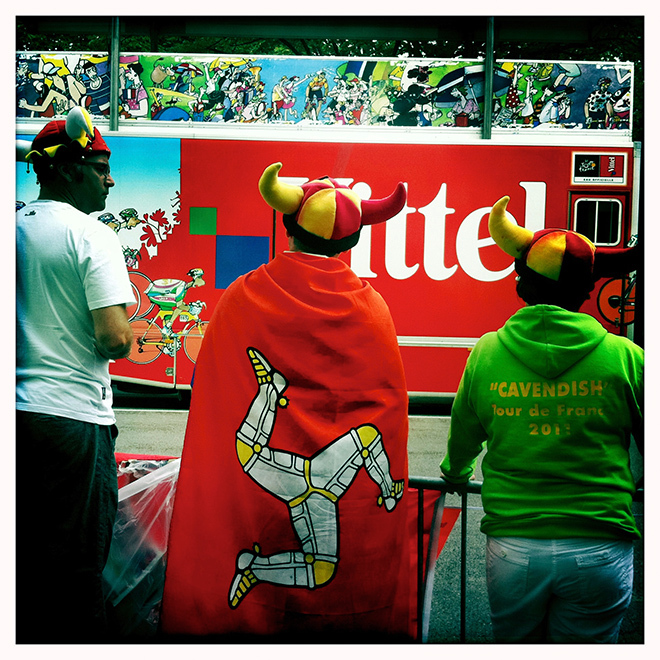 Mark Cavendish fans watch during the Stage 20 Time Trial in Grenoble, France. A photographer kisses his camera for good luck before the finish-line money shot during the Stage 20 Time Trial in Grenoble, France. Autograph hunters go to work at the Stage 20 Time Trial in Grenoble, France. 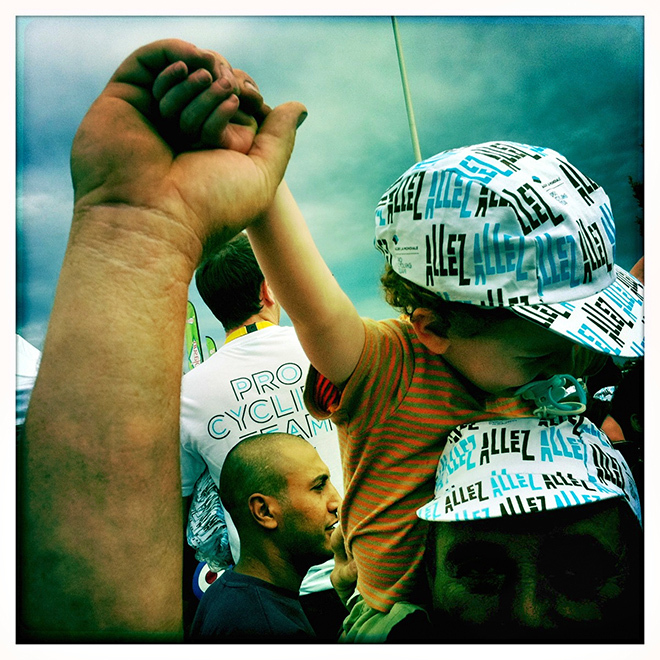 A boy reaches for a high-five from Fabian Cancellara during the 2011 Tour de France Stage 20 Time Trial. David Millar starts the 2011 Tour de France Stage 20 Time Trial. 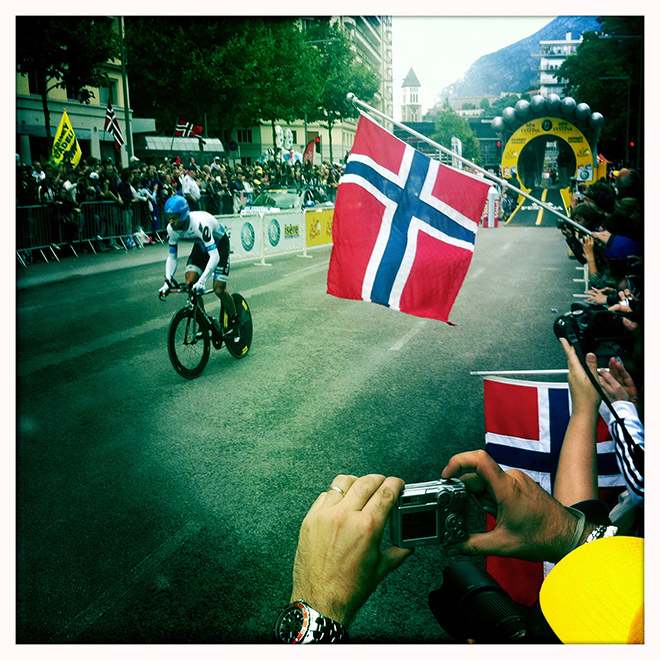 Thor Hushovd starts the 2011 Tour de France Stage 20 Time Trial. 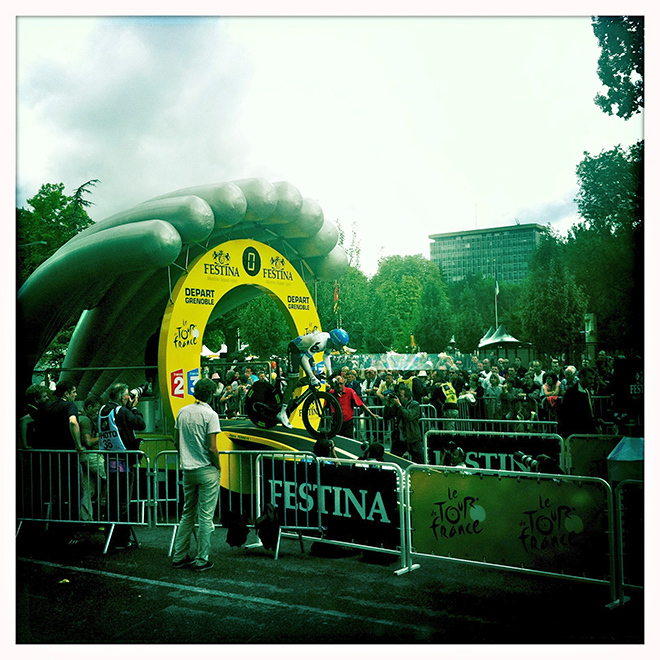 Fans scramble on top of garbage cans to see Cadel Evans on the podium after the 2011 Tour de France. 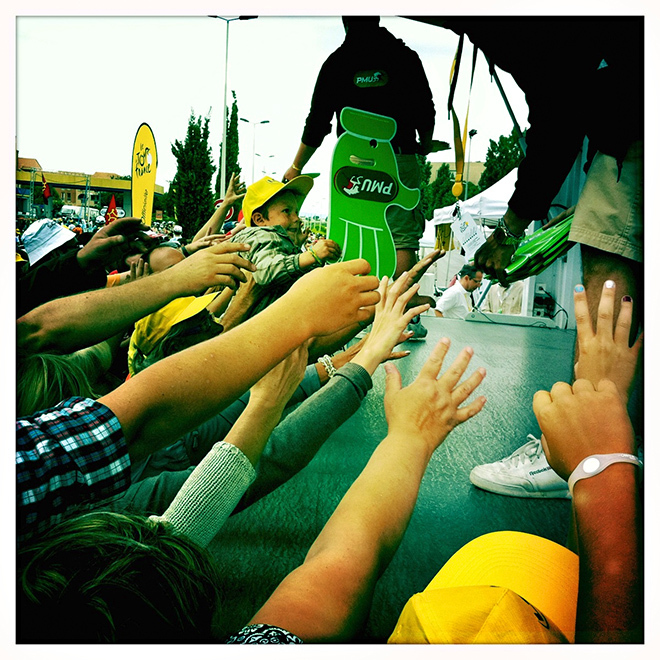 Spectators reach for handouts at the 2011 Tour de France. 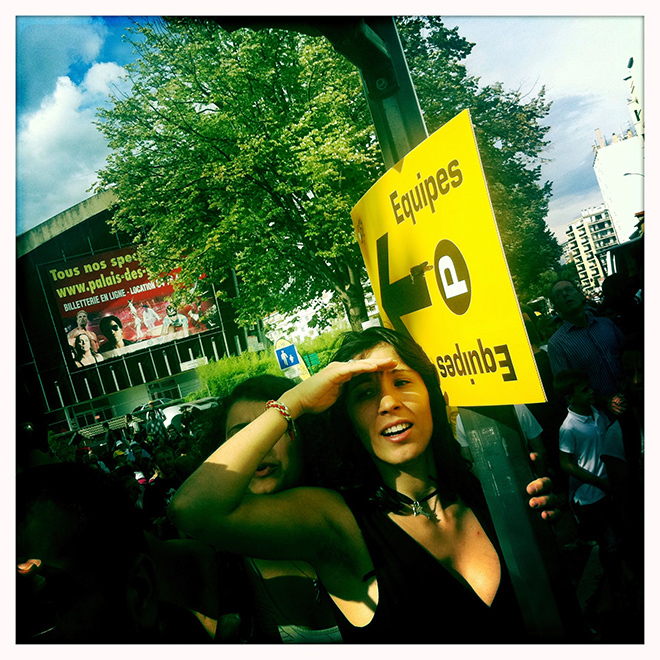 Spectators cheer at the 2011 Tour de France in Montpellier. There’s no greater misconception in photography than that it’s the gear that makes the photographer (Just ask Damon Winter). In the hands of a skilled shooter, even the iPhone 4’s camera can make compelling images. During this year’s Tour De France, an event silly with photo pros trying to make a living, photojournalist and documentarian Gregg Bleakney took the opportunity to experiment with using his iPhone to capture the experience as he saw it. No more following the herd trying to get the same shot that everyone else was getting. Wired.com caught up by e-mail with Bleakney in China to find out why he pursued the project and what it was like working without his DSLR in tow. Wired.com: So what gave you the idea for the project? Gregg Bleakney: I’d just come off an assignment at the Giro d’Italia where I was able to negotiate great photographic access and was keen to do something similar at the Tour de France. 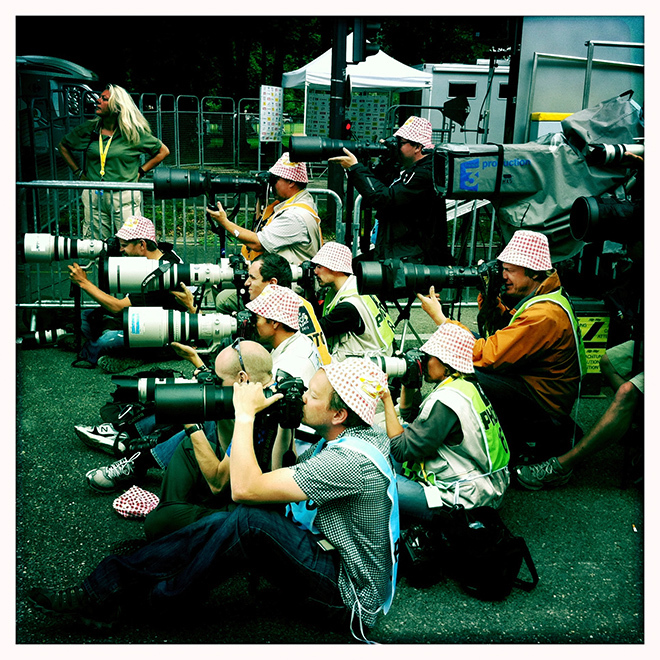 But I quickly discovered that the media environment at the Tour was an entirely different animal than the Giro — there was almost always a massive scrum of photographers jostling to make pictures of the same “behind the scenes” moments in credentialed press and team areas. As an emerging photographer, I feel like I should always push hard to separate my work from everyone else’s, and I started to look for another way to cover the event. I was really blown away by the energy and spectator culture outside of the restricted-entry press areas at the start and finish lines of the race; the occasional moments when athletes leave their security perimeter to interact with fans, the security perimeter itself, and with the spectators interacting with each other. So I decided to spend several stages working outside of credentialed areas without a press pass and jokingly dubbed this my “Totally Not Behind the Scenes at the Tour de France” project. Wired.com: What, if any, obstacles were you faced with while working on it? 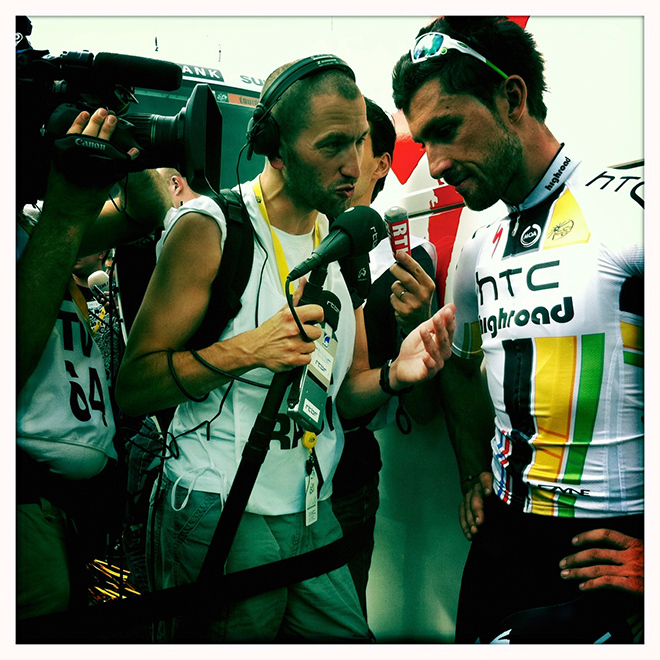 Bleakney: Many of the fans were making pictures at the Tour de France with their mobile phones, so I decided that I should do the same if I really wanted to embrace this “NOT behind the scenes” culture. I’d never used an iPhone camera seriously before, and it took some time to get used to both the shutter delay and composing without a viewfinder. But I stuck with the project idea and used couch-surfing and other social-media travel tools that week to keep my costs down. Wired.com: How do you feel about documentary work in today’s climate? Bleakney: I find it absolutely thrilling to be a documentary photographer right now — there’s no better gig in the world for me. Potential outlets for thoughtful photo essays are nearly infinite, and there are incredible opportunities to distribute work that’s executed at a high level to a global audience. Social media has allowed me to collectively learn and grow with other photographers who are sharing their work and ideas. With that being said, new (post-stock or traditional print media) revenue models are not fully established, and it can be more challenging than in the past to monetize good picture stories — but I have confidence that these things will work themselves out for photographers who really want it. Wired.com: Where are you currently based and what are you working on? Bleakney: I’m based in Seattle. I’m working on a long-term project about the sport of cycling’s new global frontiers and have spent time in Colombia, India and China this year, photographing several new events sponsored by the UCI (the sport’s governing body) to encourage growth of the sport outside of Europe and the West. It’s been fascinating to witness how, for many Western cultures, it’s become so in-vogue to use the bicycle rather than a car as an urban commuting tool, while citizens of the growing economies in Asia and the developing world (who represent the majority of world’s cyclists) are abandoning bicycles in favor of combustion-fueled transportation. I’m also working on a story about a black market smuggling operation taking place in Olympic National Park.